The survey tested knowledge of the procedures for absentee voting through a series of factual questions. The results showed that only a small fraction of Mexicans, whether they were eligible voters or not, knew enough about the procedures to file a valid application for an absentee ballot. The lack of information extended to the timing of the election itself. Only 45% of Mexicans knew that a presidential election would take place; the share of eligible voters answering correctly was 53%. An even smaller number could correctly identify the month that the election would take place, 19% of all Mexicans and 24% of eligible voters. More than three-quarters (78%) said they were aware that Mexicans living in the U.S. will be able to vote in the next Mexican presidential election. But, far smaller shares were aware of the procedures for taking part in the absentee balloting. Interviewing for the survey began the day after the application period for absentee ballots had ended on January 15. Somewhat more than a third of all Mexicans in the U.S. (36%) and of eligible voters (35%) said they were aware that the deadline passed. One fifth or less of either group could correctly identify the deadline for registration. About a quarter of Mexicans in the US (25%) and about the same share of eligible voters (27%) said they knew “something” about the procedures for applying for an absentee ballot. The survey asked a series of factual questions about those procedures, and a relatively small share of Mexicans could correctly answer on four points essential to submitting a valid application: that the deadline for application had passed, that a valid electoral credential was needed, that the application could be dispatched by mail and that it had to be sent by registered mail. 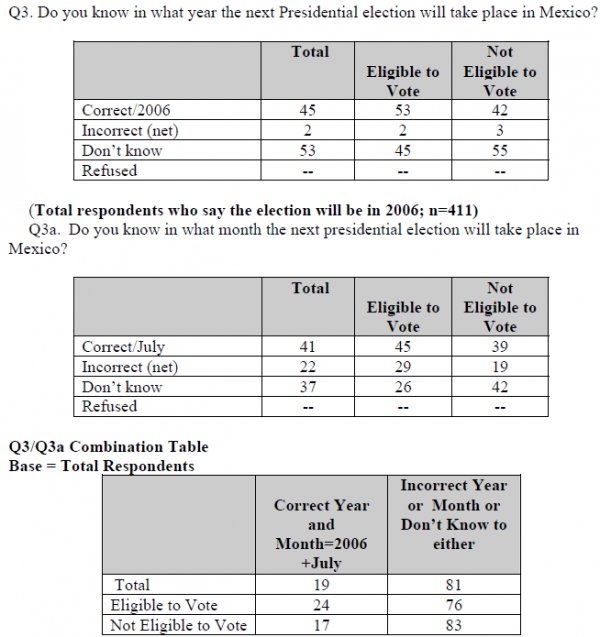 Only 7% of all Mexicans in the U.S. and 12% of the eligible voters answered all the questions correctly. Survey respondents were asked whether they had registered for an absentee ballot and 6% said that they had while 94% said they had not. Surveys in the United States and other countries questions routinely produce inflated share of positive responses when people are asked whether they have registered to vote or have actually voted. In this case the 6% positive response far exceeds the share of Mexicans living in the U.S. who actually submitted applications to the Mexican elections institute. Of the survey respondents who said that they had registered for an absentee ballot, only 23% could correctly answer the battery of questions on the applications procedures. That means than less than 2% of all Mexicans surveyed said they had registered and knew how to register which is in line with the actual number of applications received by the elections institute.